The installation bridges tv and radio. Last May, following a call for tender, Radio France selected Luxembourg-based systems integrator BCE for the integration. “The brief was to maintain the experience of making continuous news which Radio France has been doing for 35 years while adding a new TV dimension,” explains Michel Ranson, Directeur Adjoint à la direction des Moyens Techniques at Radio France. “We also wanted to keep the same production methodology and existing tools including the OpenMedia News Management system from Annova. 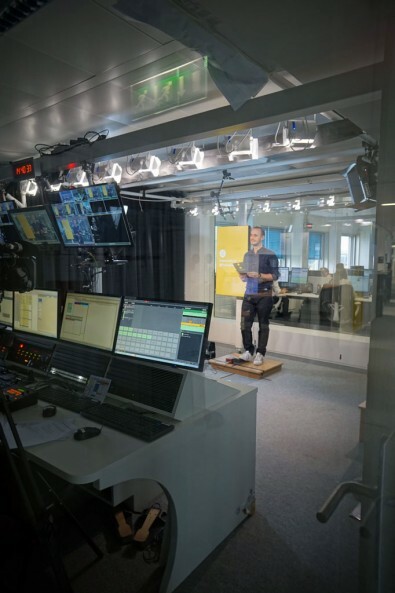 In just three months, BCE teams installed three production studios with respective control rooms and an automated platform, Mosart from Vizrt, to manage the content and the branding of Radio France. The key editorial philosophy was to deliver TV news at the pace of radio news. Ranson, dubs it “an almost industrial pace of production”. That meant delivering a one minute headline news programme every 10 minutes, from six o'clock in the morning until midnight. The presenters work in shifts with content created by Visual editors who send information to automated production platform Viz Mosart which manages the continuity of the information. To achieve this, BCE and Radio France created a new Headlines Control Room. Located in the Radio France newsroom, presenters read breaking news headlines every 10 minutes simulcast on tv and radio. Located next to them is a video totem or vertical screen which broadcasts content matching the topics synchronised with the teleprompter and prepared by other journalists. The presenter has foot pedals to change the content on the screen. In addition, radio Studio 421 has been transformed into a multimedia studio equipped with seven HD motorized PTZ cameras as well as a video wall located behind the guests that display news, logos and channel branding operated by the automated production platform. A new production control room has been added to the existing radio platform. 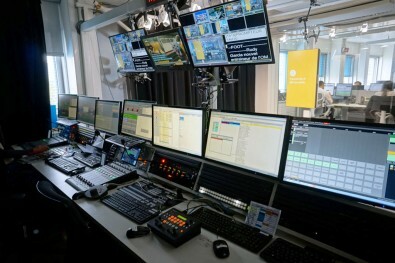 This infrastructure controls cameras, sound, the video wall as well as all the secondary events for TV broadcast. Presenters read breaking news headlines every 10 minutes simulcast on tv and radio. “Studio 421 perfectly marks the transition between radio and TV, merging the two worlds by broadcasting content on both radio and television," says Philippe Mauduit, Directeur Général Délégué at BCE France. BCE trained radio journalists to become visual editors to perform video editing. “We’ve also trained the operating and support team of Radio France to the new media workflows of the channel,” says Pascal Montagna, Responsable formation chez Aski-da Taldea, and partner with BCE on this project. A third studio was also revamped. Studio 221 is used for talk shows such as the daily political show hosted by Jean-Michel Apathie and another political programme ‘Les informés’, broadcast in the evening and followed by ‘Le Classico’ that focuses on sports news. This studio is equipped with ten robotic HD Panasonic HE-AE130 cameras including one with motorized rail. The programs are broadcast both on radio and on television. To keep the soul of the radio, the studio has voluntarily been equipped with swan neck microphones. The studio also has several screens on which are broadcast content, branding and sets. 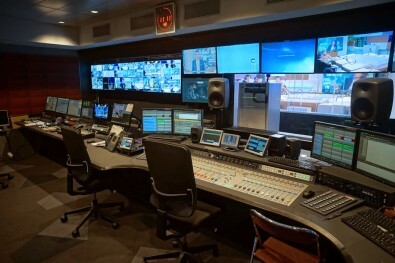 Integrated in the new control room are SAM edit and server systems and a SAM switcher, DHD audio equipment and a Vizrt graphics system, all perfectly connected to the Mosart automated production platform.